The film opens with young Zain standing in his underwear in an examining room of a detention center. He’s silent and shifting his feet nervously. A doctor is conducting a routine check-up, and estimates the age of the boy before him is probably about twelve, perhaps thirteen years old. Like a stray runaway or shelter rescue, Zain’s identity – and his entire life for that matter -- is a matter of pure speculation. The camera then turns to a group of women of mixed ethnicities, whose identification papers are also a matter of suspect inquiry. Name? Passport? Work permit? The particular locale for the film just happens to be Beirut, but the underlying story and issues raised in the film about refugees, illegal immigrants and family separation are, of course, trans-global. 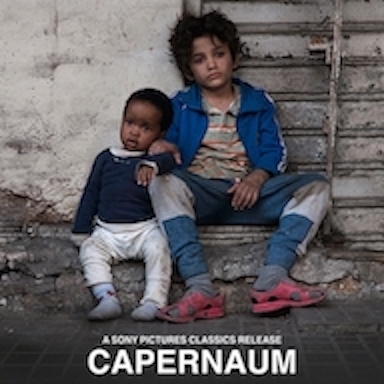 The film’s title, “Capernaum,” finally scrolls across the screen, including the translation, “Chaos.” The set-up for the story is about to unfold. In the midst of chaos, what will happen to Zain? What will he do? In handcuffs, he’s escorted into court and is ordered to stand before a magistrate. He’s already been convicted of a violent, retalitory act the viewer will later understand. But for now he’s turning the tables, filing a lawsuit against his parents. He’s suing his parents because they have no birth certificate for him. He’s suing them for having given him the life into which he has been born. Now we flashback to an earlier chapter in the story to a life of squalor, with a family swarming with siblings and destitute poverty, Zain tries in vain to protect his older sister from the common fate of young girls reaching adolescence. When Sahar is married off at 13 -- and with few options in what seems like something akin to a Grimm’s fairy tale – Zain boards a bus and literally runs away to the circus. There, he first encounters a toothless, costumed old man. He’s a carnival barker, who calls himself “Roachman,” while only slightly resembling the superhero Spiderman! Next, there’s the young, single mother from Ethiopia, Rahil. She first chuckles at Zain’s mischievous behavior that betrays his maternal hunger; before befriending him and taking him under her wing. In return, Zain essentially adopts her toddler son, Yonas, as if he’s his own younger brother. Out of the unlikeliest assortment of misfits and strangers, the boy learns from bitter experience what constitutes a true family. It’s about caring for each other, whatever the chaos may be in what is literally the mean-time. Capernaum is not based on a true story. However, it is the truest possible story. Because all the people who portray all the fictional characters in the film Nadine Labaki wrote and directed are not professional actors, but ordinary, real people who depict what it means to be human. Capernaum is a tough, gritty, episodic film to watch; where the best and worst in human-kind are exposed in the chaos we inflict on one another, and endure. In the end, a little human kindness will rise to restore what it means to be part of the human family. And Zain will smile for almost the first time in the entire film.